In October of 2003 the BHAS Field Unit were invited to conduct a geophysical survey in the garden of a house at Graftham, West Sussex. 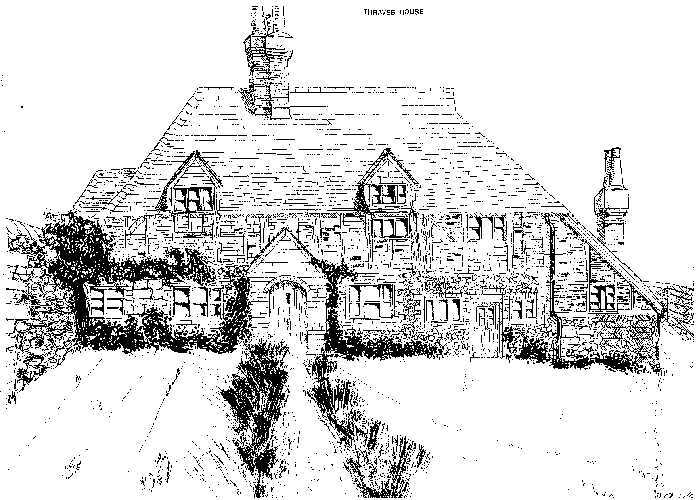 The house called 'Thraves' (see drawing) was built in 1410 and is a typical 4 bayed hail house. Dr Annabelle Hughes (medieval buildings specialist) has recently visited the property and considers that the house is not complete, and this is quite obvious when viewing the house from the east, where it can be noted that the doorway and chimney are out of symmetry. Dr Hughes suggested to the owner, Mr Peter Hawkins, that BHAS conduct a resistivity survey to look for evidence for the missing fourth bay in the adjacent garden. When the team, led by David Staveley, arrived on site a small excavation had been conducted in the garden by the Chichester group and they had found evidence for robbed walls that would have been the missing fourth bay. The excavation, which was still open, showed that there was a large deposit of demolition material overlying the garden in this area, and that it would be very unlikely for the geophysics to produce significant results. However, the team conducted a small survey in both the front and rear gardens producing some interesting results in the garden adjacent to the house. The front garden produced nothing of any relevance, due to the depth of overburden. The results did however, indicate linear features that may be associated with the medieval phase, but only excavation can provide dating and confirmation. The owner of the property took the team on a conducted tour of the interior of the house, and many of the CCE students working with David Martin were able to point out appropriate medieval building features. A report on the geophysical survey has been passed to the house owner and to the West Sussex Assistant County Archaeologist. The reports on the field walking conducted at Varley Halls and the Roman nail scraper found at Lancing Down were published in the Sussex Archaeological Collections Volume 140. In January and February of 2004 the BHAS Field Unit conducted a field walking survey of lands at Lower Hoddem Farm, Peacehaven. (Ref TQ 416018). The field is divided into 3 sections, east, west and south. An initial field walking of 10 lines in 2003 had found two Neolithic rough out axes, and significant amounts of flint tools. The field walking of 2004 completed a survey of all three fields with some very interesting results. The field has been identified as the possible location of a Neolithic flint tool manufacturing site, probably utilising natural resources from the cliff faces along the coast close to Newhaven. (Pers. Comm. O.Gilkes). A local lady, Mrs Schultz had collected a number of Neolithic axes when she worked on the farm, and allowed members of the Society to examine and photograph them, however their exact find provenance is unknown. A number of Mesolithic blades have also been found in a field close by, by local historian Mr Tony Paine. For field-walking the fields were divided into lines spaced 20 metres apart, and each line was walked in 20 metre long transects. The weather was predominantly fine and sunny with only a little drizzle on the final day of walking in the south field. Finds recovered were mainly of flint, both waste flakes and fire cracked flint. However, a significant number of flint tools were also recovered. The tools included scrapers, piercing tools, notched pieces, a number of beautiful blades and blade fragments and a total of 9 Neolithic axes. Other pieces included a possible early Neolithic blade and sickle. The dot density diagrams are indicating possible concentrations of material in a number of places across the east and west fields. The south field contained countless pieces of fire cracked flint, and considerable quantities were collected, counted and weighed during the field walking project. The fields at Lower Hoddern Farm are obviously the site of considerable Neolithic activity. However, as the fields consist of a very rich sandy loam and have been ploughed for some time it is unlikely whether ancient features are preserved below the plough soil. It is possible that alluvial activity in the shallow valley bottom may have produced deep enough protection, and a survey of the results may indicate the potential for some assessment excavation. The fields are close to one of the proposed areas for the Brighton sewage site, and a professional unit may be conducting excavations in the field to the east of the one walked. In the centre of the field was a small concentration of Roman pottery, including the rim of a burnished vessel and the base of some grey ware. The dozen sherds recovered from the field walking are too small to suggest a significant Roman presence and further walking around this localised centre may be necessary to produce other fmds. The Roman material could possibly be a small local site, or may indicate pottery being moved from other locations through manuring or isolated soil dumping. The fields of Lower Hoddem Farm have produced significant amounts of Neolithic flintwork to justify further investigation. Once the concentrations are analysed it is likely that BHAS may return to the fields for geophysical surveying and some archaeological excavation. The Field Unit are planning a number of projects in 2004; excavations will continue at Rocky Clump and we hope to receive permission to conduct assessment 'digs' at both Ovingdean (to look for a dove-cote) and at Millbank Wood, Stanmer (to look for a Tudor mill). Geophysical studies are planned at a number of locations including Ovingdean and Peacehaven. Once permission is received the Unit will begin the first phase of a major project at Woodingdean, this will include geophysics, field walking and possible excavation, the site is part of the cemetery extension and the land has produced a number of linear earthworks. Aerial photographs of the field to the south of the cemetery have shown soil marks, these suggest some form of activity in antiquity. The field walking project may be able to produce some datable evidence for the features noted.